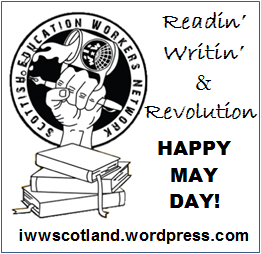 The Scottish Education Workers Network is now in its second year as an IWW-initiated industrial organising project. Our purpose is to help bring together workers throughout the education sector and across job titles. SEWN stands for eliminating the disparity in status, pay, and benefits within the sector, and discrimination based on gender, religion, ethnicity, or physical difference. We believe that all workers in the education sector have a right to make workplace decisions via grassroots democracy. We believe that through initiatives like SEWN, we can become more aware of, and break down, ways of thinking and acting that the capitalist system teaches us and reinforces at every turn. We can create new paths toward working class comradeship and empowerment. We recognize that attaining these goals requires both workplace and community efforts. Bolstered by the support and assistance of our general membership branches, we in SEWN are working in both spheres. For example, this past autumn and winter we acted in solidarity with Higher Ed and Further Ed workers fed-up with negotiations that go nowhere on the issues of pay, pensions, and working conditions. Thanks to our dual carders, we were able to stay informed about, and respond to, upcoming strike actions, and the hypocritical rhetoric and deceptive and collusive tactics of the TUC bureaucrats. As an alternative, SEWN put together an Escalation Not Capitulation leaflet for distributing on the picket lines. This spring we will have new leaflets for students; will be challenging the action by some schools to dock workers a whole day’s pay for two-hour strikes; and doing more outreach throughout the ed sector, particularly the nursery, primary, and secondary sections of it. Issues we will be focusing on include the unconditional right to strike; higher wages and lower work-loads; end of zero-hours contracts, privatization, and wage gaps within the sector; reverse pension and programme cuts; no pre-set curriculum or teaching to the test; and education for liberation by teacher-learners in a culture of sharing and trust. Along with workplace agitation, we are committed to connecting our issues and organising goals to campaigns such as uniting health care, housing, transport, clerical, social service, and education workers to fight budget cuts and take a stand on workfare and medical assessments; providing full funding for public services by taxing the rich; and pressuring councils to pay back the Common Good Fund. During the coming months, we also will be discussing how we can expand the settings for our work– bringing our values and resources to neighbourhood centers and other groups and projects within our community. Collective action, class consciousness, open learning, alternative structures, worker solidarity, the common good, and socialism are ideas that are as pertinent and important to campaigns and to efforts at community organising as they are to industrial organizing. Just as an injury to one is an injury to all, so is the strength of one the strength of all.